My head is swirling a bit at the moment in trying to keep track of the constant bombardment of interviews with Michael this week in preparation for the wide US release of Fish Tank. But I'm doing a good job in filtering through the interviews and finding the articles that are true gems. I want to share with you three Michael interviews as I feel they each highlight something unique in each interview and bring out something in Michael that makes the interviews more informative and fun to read. As I post nearly daily at Awards Daily (AD), I discovered this morning that one of the regular contributors at AD, Stephen Holt, interviewed Michael! I quickly read the interview and just came to admire Stephen's interview style and his ability to make it an informal and personal interview with Michael. I reckon it's the standard formality of interviews with Michael that has made some of the interviews repetitive in tone and generic. It's no fault of Michael, but what most interviewers lack that Stephen has is a real genuine appreciation for the art of film making, and having a true interest in the subject matter. Upon reading Stephen's interview with Michael, it's clear he is a massive fan of Michael, and surely Michael picked up on that and came to feel more relaxed and comfortable in the interview. And as you will read yourself, it is revealed that Stephen and Michael shared a mutual beloved friend who died on January 2nd. Michael became emotional during the interview in discussing their friend understandably. And because Stephen knew their friend, Michael Dwyer, a highly respected openly gay film critic in Ireland, it just made this moment more honest and evokes our sympathies. I asked Stephen if it was ok for me to post a link to his interview as well as post a link to his show on YouTube. He delightfully gave me his permission and specifically stated that if we wanted to see the interview between him and Michael Dwyer, in which they discuss Michael Fassbender during TIFF 2008, I could post that link too. And so I shall. Go here to see the Dwyer interview, it's lovely. And to read Stephen's interview in its entirety at Awards Daily, go here. I hope to meet Stephen at TIFF 2010, because as you will see at the end of the Dwyer interview, he's a riot and just LOVES T.O. & TIFF like I do! And in my emails with Stephen this afternoon, he told me that if I wanted to see just how big Michael is getting, that I should go to the Times Out New York (TONY) site to read their article/interview on him. And yet again, it's another cool and revealing interview with our man. Check out Michael's TONY interview. I just love his attitude and sense of humor. And last but not least, Slant magazine interviewed Michael and it's funny how he drives the female interviewer crazy with lust. Can't blame the sister can we? Boy, it makes me want to see Fish Tank again, right now! If you're a regular reader of FF who hasn't seen Fish Tank yet but plan to this week or soon afterwards, please share your review of the film. I'm very curious as to how you all thought about it. Hey, sounds like I need to make another poll. I love Fish tank even though I kind of knew what would happen the dialogs and the acting made the film. I read a review of the film in a Swedish newspaper. I had seen films with him before(300,inglourious basterds ) , but I really noticed him now, in fish tank. 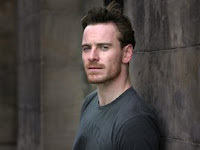 Hey Razia, I'm glad you are starting to enjoy Michael Fassbender now. I hope you continue to visit FF to keep up to date on what's going on with his career. Thanks! I like that picture of Michael too Dezmond. Michael's the kind of guy who looks great dressed up or down, and with his hair styled differently. Which interview are you referring to that you 'didn't get'?